Great news! We received our building permit last week, and we’re now able to finish the Boulder Alano Club construction project. 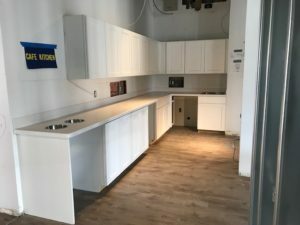 This is a picture of our kitchen – we’re so excited to be able to share the Club with the recovery community. We’re going to celebrate our grand opening and hold a membership drive on September 8th. Click here to learn more about it! Is there a schedule for opening? Please let me know. My wife and I are excited to be part of and meet new fantastic people! God bless. We’re keeping our fingers crossed to have our first meeting at the Bouldder Alano Club on October 13th. We’ll keep everyone posted!